When it comes to getting a picky eater to eat, I think half the issue is presentation. Kids like fun looking food. Granted us mom’s only have so much time in the day, but when I do have the time, I like to make M’s food look as creative as possible. 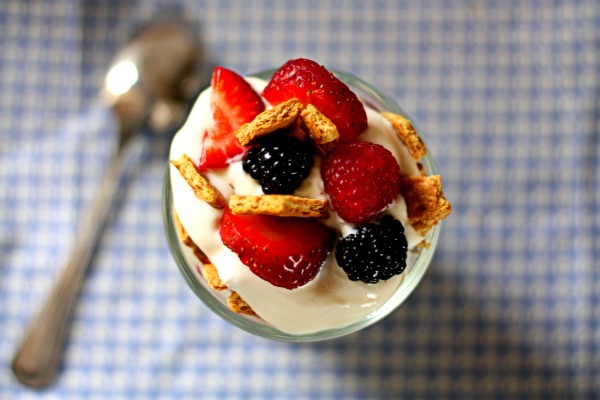 Three of M’s favorite foods right now (because they can change any second) are graham crackers, berries, and yogurt. If that’s all I gave her to eat all day she’d be a happy camper. What I’ve come to realize is its all about presentation. If I sat her at the table, gave her a container of yogurt, a couple of graham crackers, and a random assortment of berries, should wouldn’t complain. But when I serve it to her like this… her eyes light up like a kid in a candy store. She gobbles as much as her little belly can hold. 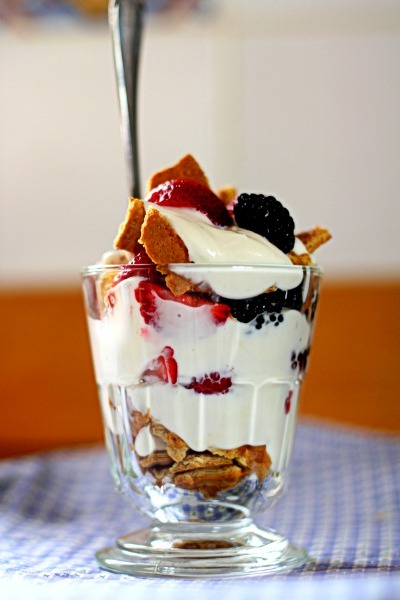 To make this all you really need is three ingredients, 2 graham cracker sheets broken into pieces, fresh berries, and vanilla greek yogurt. You can buy vanilla greek yogurt (Chobani makes a good one) or you can mix up your own like me. M’s not quite 2 years old, so she still need whole fat dairy. 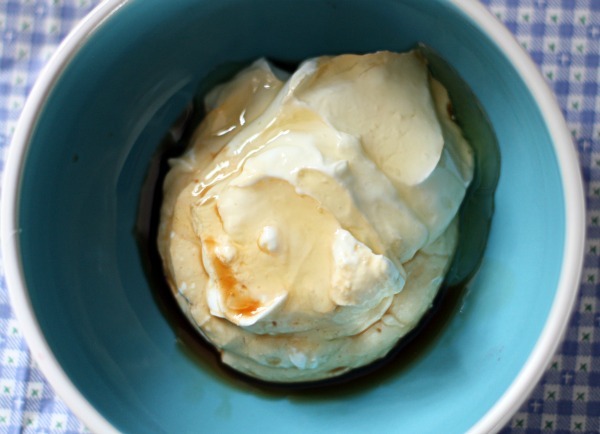 For the yogurt I mix 6oz full-fat Fage’ greek yogurt with 1/2 tablespoon honey and 1/2 tsp vanilla. 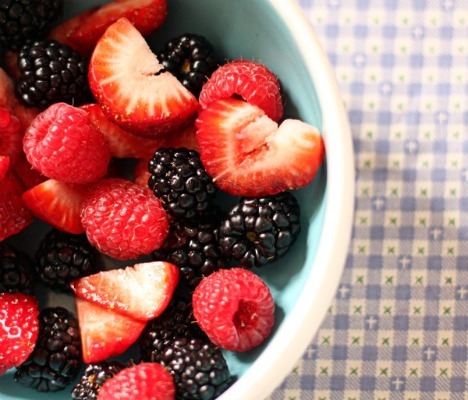 Love this snack. So cute. Yes please! I am so with you on making healthy food fun for kids. If you don’t, they are just not interested. This looks so good! this is such a beautiful snack…i’d rock it! Forget kiddie treat…I would definitely eat this!!!! Looks light and refreshing! Happy v-day! Looks like a tasty snack at any age. 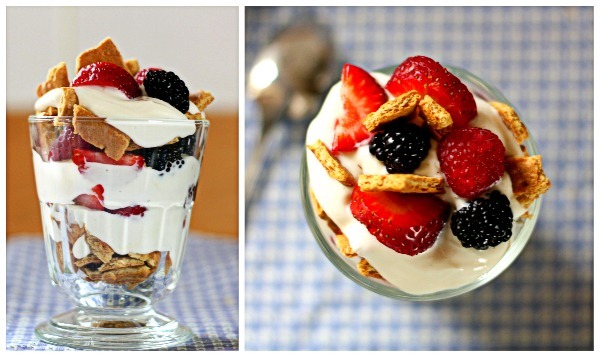 I’m definitely a fan of the parfait. I think I’d even be excited if someone served that to me. Have a great day! Perfect treat for a little one…or me! 🙂 Happy Valentine’s Day!! That looks absolutely delicious. I want to gobble it up, too! Healthiest Valentine’s Day treat I’ve seen so far. Enjoy spending Valentine’s Day with the lovely Miss M!